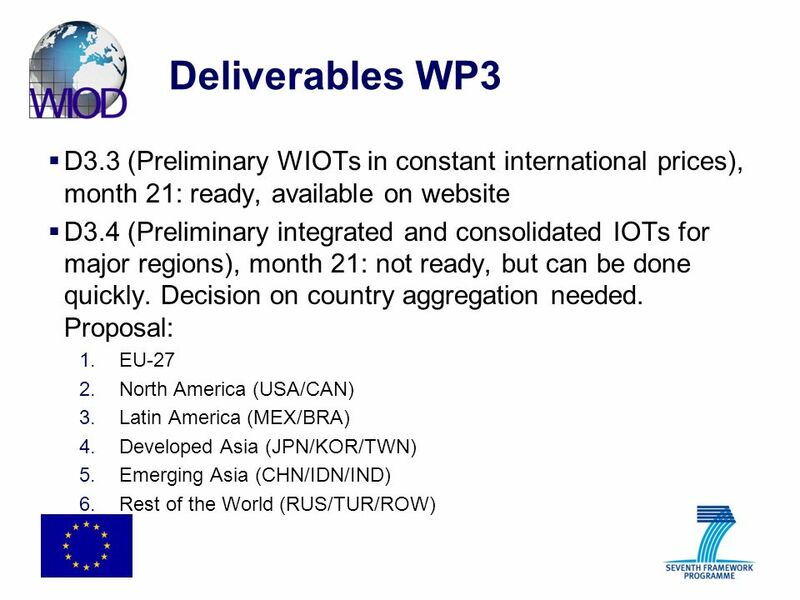 WIOD (World Input-Output Database): Brief Overview of Data Construction Activities in WP3 Bart Los Faculty of Economics and Business University of Groningen. 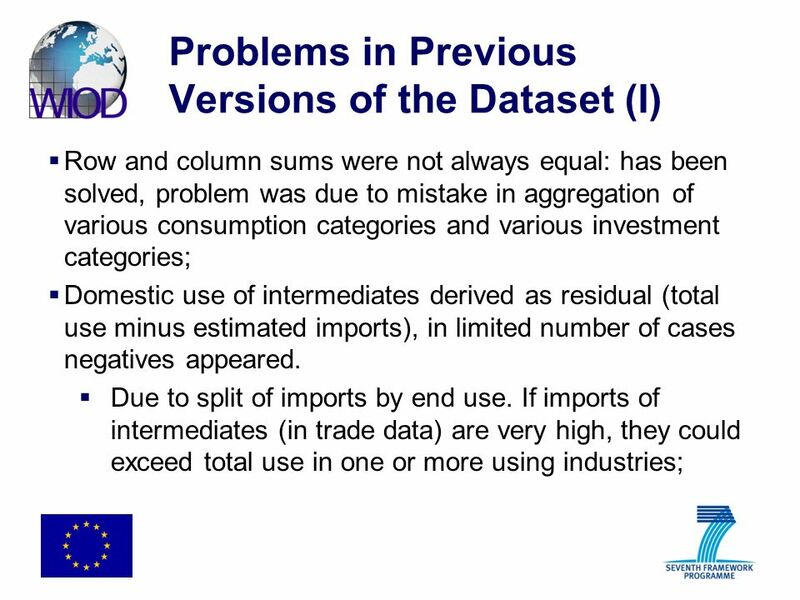 6 Problems in Previous Versions of the Dataset (II) Solution (for now): assume that import ratios are uniform across all using industries and final use categories. 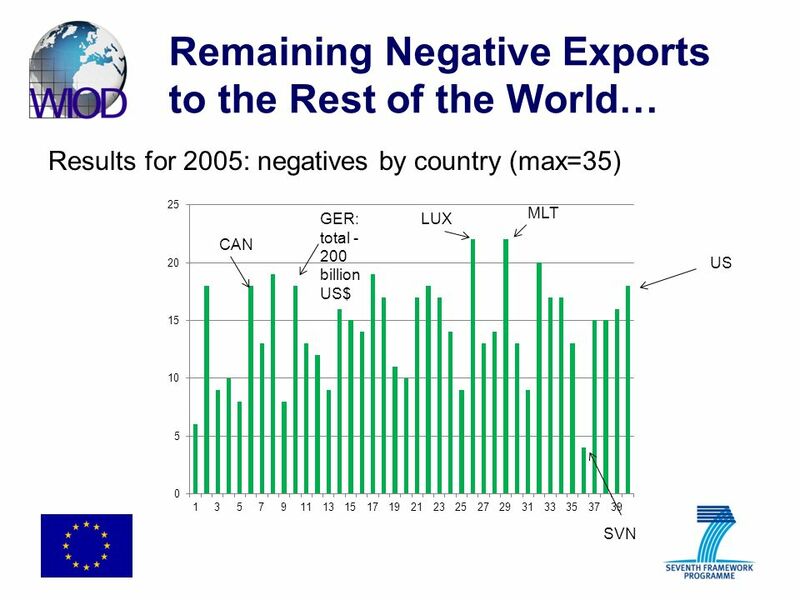 Negatives only appear if total imports exceed total use minus exports. 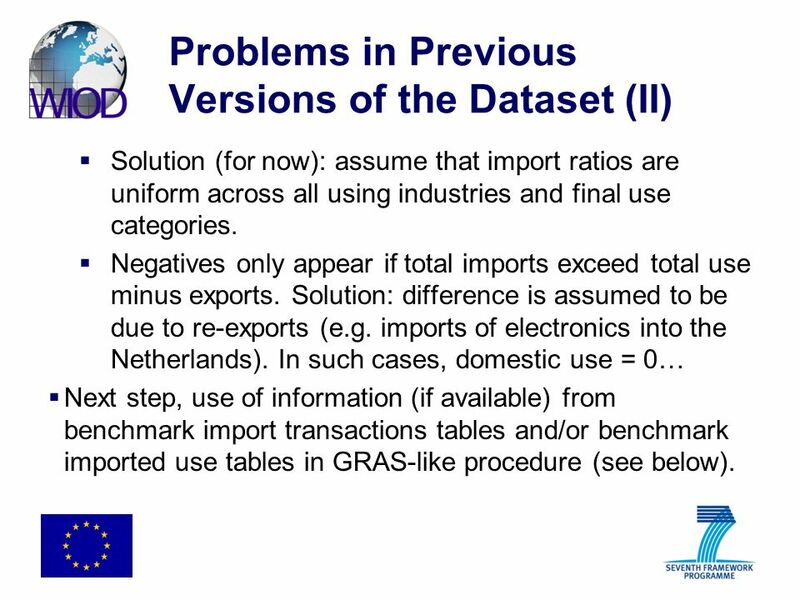 Solution: difference is assumed to be due to re-exports (e.g. 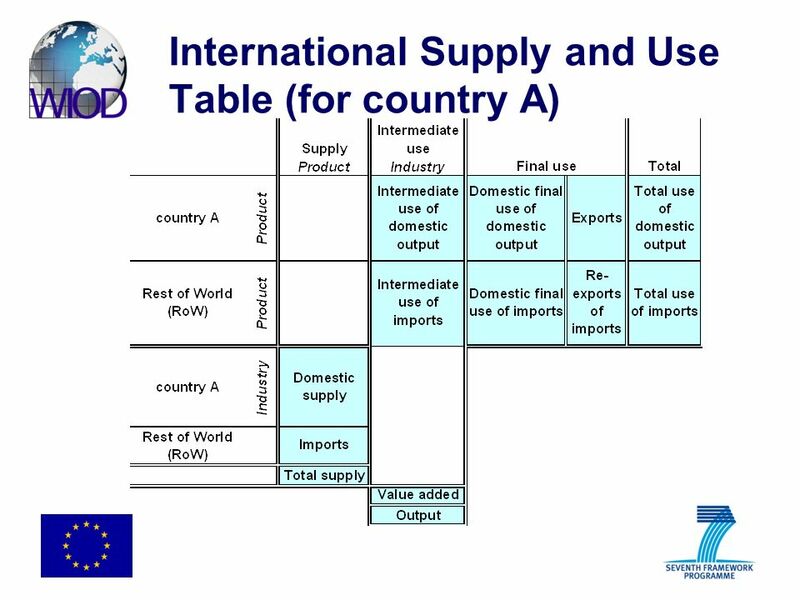 imports of electronics into the Netherlands). 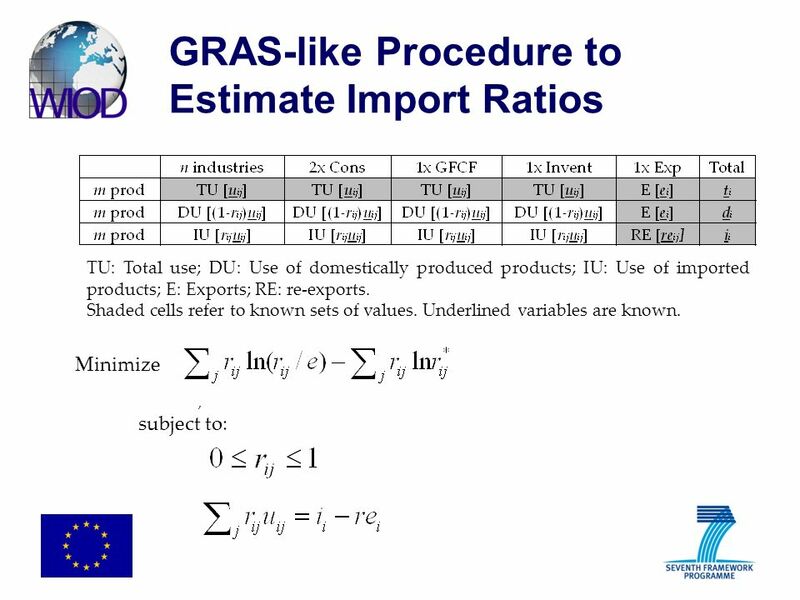 In such cases, domestic use = 0… Next step, use of information (if available) from benchmark import transactions tables and/or benchmark imported use tables in GRAS-like procedure (see below). 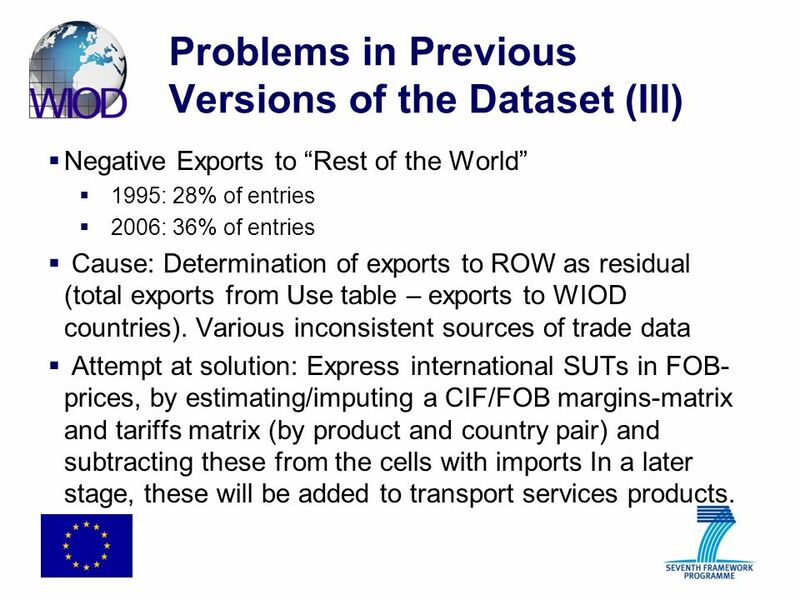 7 Problems in Previous Versions of the Dataset (III) Negative Exports to Rest of the World 1995: 28% of entries 2006: 36% of entries Cause: Determination of exports to ROW as residual (total exports from Use table – exports to WIOD countries). 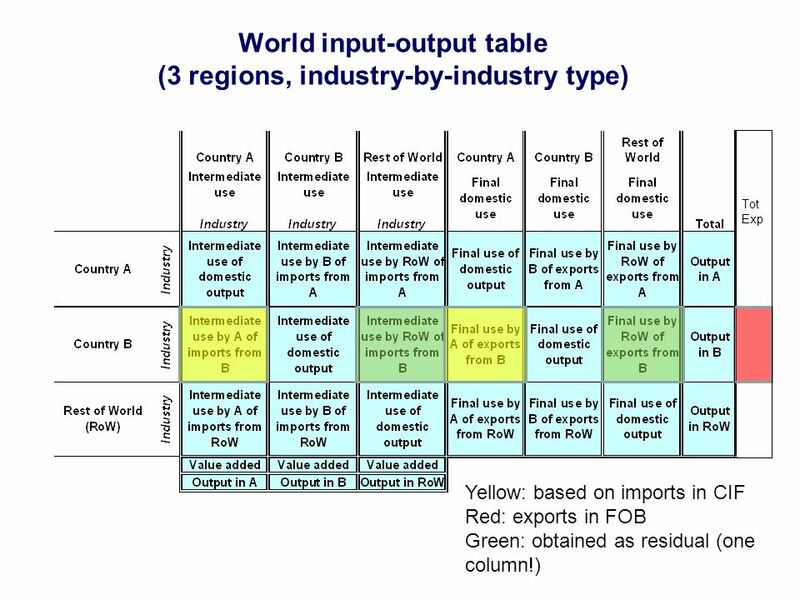 Various inconsistent sources of trade data Attempt at solution: Express international SUTs in FOB- prices, by estimating/imputing a CIF/FOB margins-matrix and tariffs matrix (by product and country pair) and subtracting these from the cells with imports In a later stage, these will be added to transport services products. 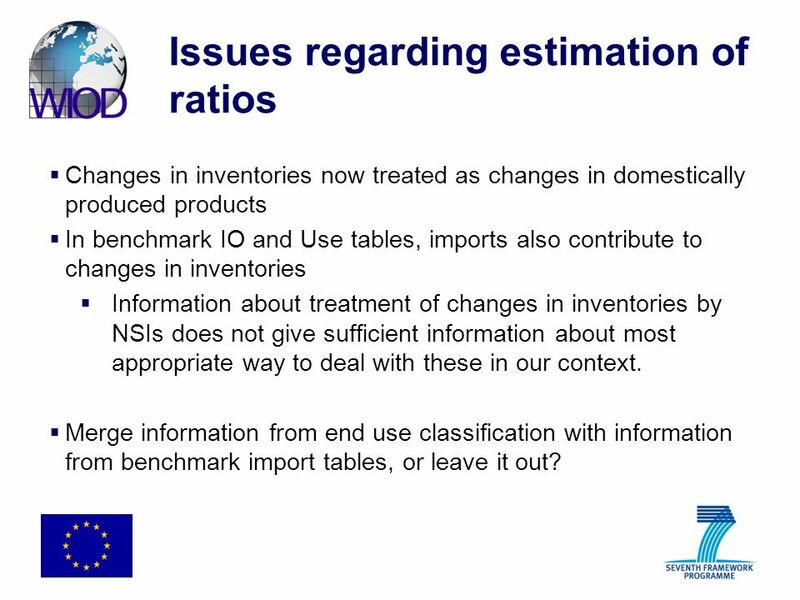 12 Issues regarding estimation of ratios Changes in inventories now treated as changes in domestically produced products In benchmark IO and Use tables, imports also contribute to changes in inventories Information about treatment of changes in inventories by NSIs does not give sufficient information about most appropriate way to deal with these in our context. 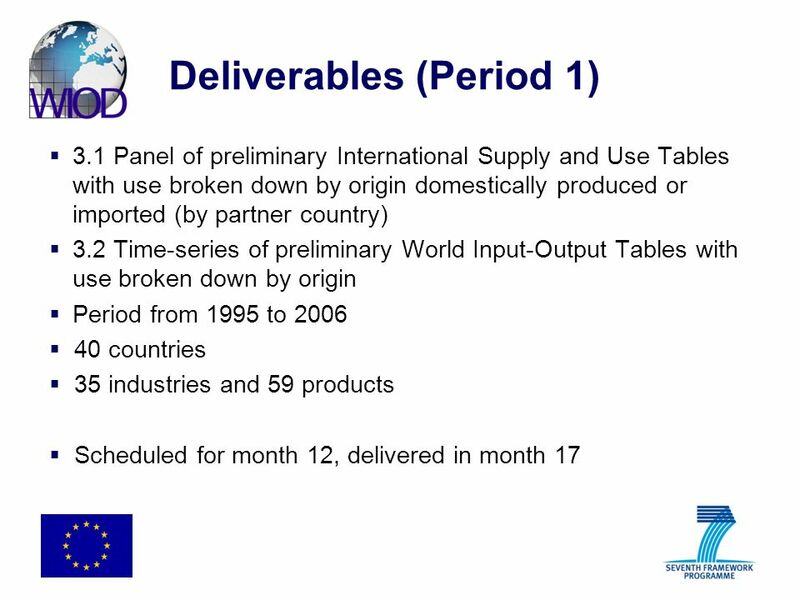 Merge information from end use classification with information from benchmark import tables, or leave it out? 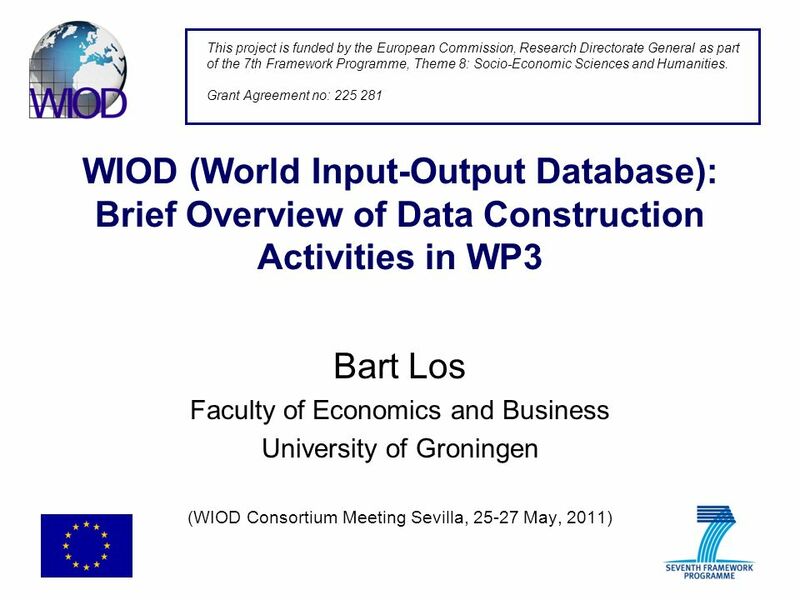 Download ppt "WIOD (World Input-Output Database): Brief Overview of Data Construction Activities in WP3 Bart Los Faculty of Economics and Business University of Groningen." 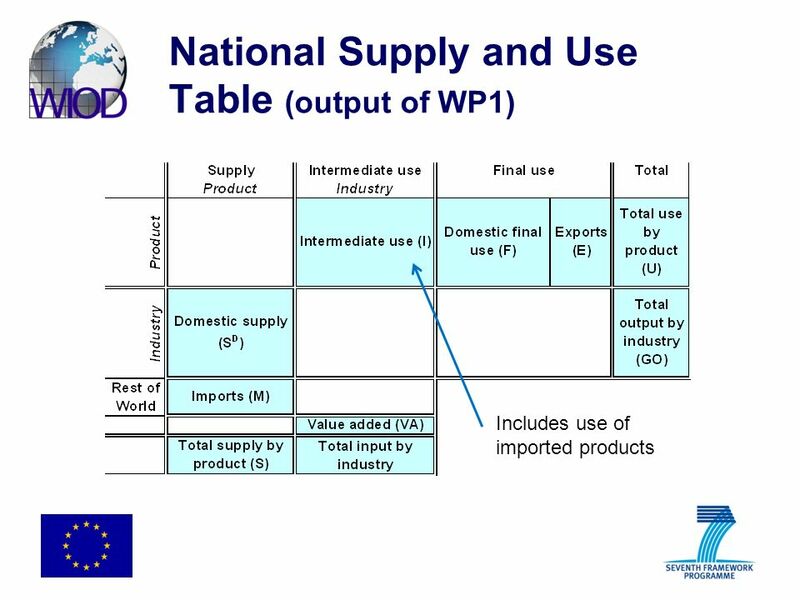 International Comparisons of Industry Output, Inputs and Productivity Levels: Methodology and New Results Presentation prepared for Discussion session. 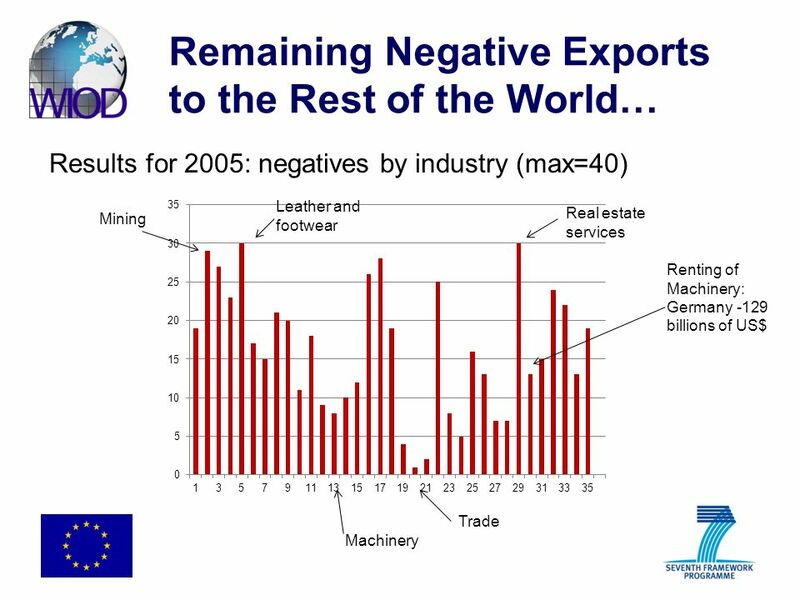 An alternative presentation of trade by Product and Industry. Checking results against survey data OECD Statistics Directorate. Bettina Wistrom, Alena. 3rd ICP 2011 Technical Advisory Group Meeting at the OECD, Paris 10, 11 June 2010.